Before I pull the top cover off, I put my hands on the sides of the hive for a few moments to let the girls know I’m there. I think about the hive and what new mystery might be waiting inside. Then I give a gentle puff of smoke to the entrance and begin. I have to pull the honey supers off the top before I can get to the actual inner workings of the hive. The supers are the boxes where the bees make and store the bulk of their honey. 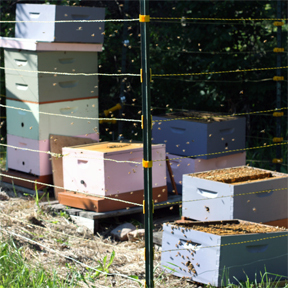 They are about half as deep as the hive boxes, which is a good thing – honey is heavy. There are bees in these boxes as well, working to store and cap the honey, but the queen and the bulk of the hive are down below in the deep boxes. The photo below is from the gangbuster honey harvest of twenty-ten. With the honey supers set off to the side, I can start pulling out individual frames from the hive boxes. This is where the real action is. And there, on the very first frame I pull, is Queen Freeda. I don’t always see my queens, but it’s a treat when I do. They are magnificent. Long, slender, and graceful. Everything you’d expect from a queen. But there was something else on the frame. A tell-tale, peanut sized queen cell hanging near the bottom. This only means one thing. It means you’re about to lose your queen, half of your foragers, and a good quantity of the honey stores to boot. In other words, it means that the hive is getting ready to swarm. 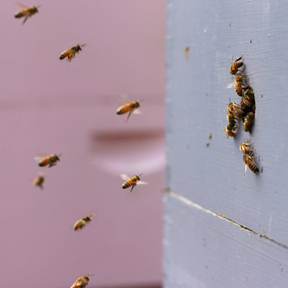 When a hive is bursting with bees in the height of summer, they can start to feel a little cramped in their quarters. To remedy this, they make the decision to split their population in two. The workers will being to feed several small larvae copious amounts of royal jelly in specially constructed queen cups. 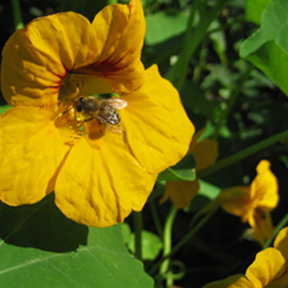 Royal jelly is a substance secreted from glands in the heads of worker bees. And it’s what makes a larvae develop into a bee with fully formed ovaries – it’s what turns what would otherwise become a regular, non-fertile worker bee into a queen. Pretty cool. But I’ve digressed. Back to the down and dirty details of a swarm. Shortly after these queen cells are underway and developing, roughly half of the bees in the hive will load up on honey and take flight with the original queen in tow. Within a few days, a new queen will hatch in the hive. Her first order of business is to destroy any other developing queen cells. Shortly after, she will exit the hive for her one and only mating flight. If the stars align and the weather is good, she will return to the hive and begin laying eggs in a few days. Meanwhile, the rouge gang that left the hive will have sent out scout bees to find a suitable place to take up residency. Two hives become one, and everyone has a little more elbow room. Preservation first hand. As a beekeeper though, the trick with these shenanigans is to keep both halves of the hive in your possession. It bodes for a much better honey harvest. One way to accomplish this is to be ready the moment the hive decides to swarm and hope they land somewhere where you can capture the big cluster to install in a new set of hive boxes. This method is dicey though and generally requires either a sixth sense or constant vigilance. I’ve never managed to successfully re-hive a swarm. The other way is to intervene and create sort of a mock swarm. This involves removing the frame that has the original queen on it, along with 9 other frames of bees and honey, and setting them up a new hive box. The rest of the hive is left as is, with the developing queen cells. But since there is now no queen in the hive, and because their population has been reduced by removing a box full of bees, there is little desire or capacity to swarm. The first new queen to hatch will take her mating flight and return to be heir to the hive. I was positively giddy when I discovered what Freeda was up to. I knew instantly that I wanted to divide her hive. I tried not to get ahead of myself, but my mind raced with thoughts of having Freeda AND her daughter. I’ve boasted about Freeda before – how pleasant her girls are, and such workhorses! I’ve never had a nicer, more durable, sincere, hard working queen. And what luck to have her be right where I needed her. I ran to the car for an empty hive box to isolate her. 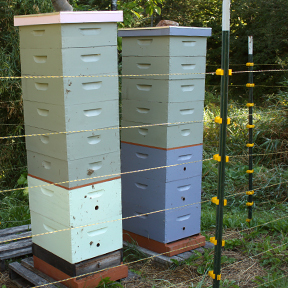 Then I raced back home for the rest of my equipment – a hive stand, a bottom board, another hive box, and an inner and outer cover. I was running around with the excitement of a kid on Christmas. Out of breath I called my friend and bee mentor Kris for moral support. I’ve split hives before, but always with purchased queens to install, and never in height of summer with so many things to think about. Back at the bee yard, I got to work building up a new hive box for Freeda with the appropriate mix of honey, pollen, bees, and larvae. I discovered that in my initial haste I had damaged the queen cell hanging from the bottom of the frame. 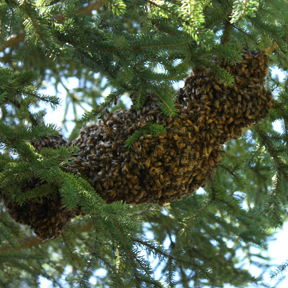 But I didn’t think much of it – there would be others in the hive. And besides, I didn’t want to put a developing queen into the split hive anyway. The new queen could hatch and spur a mini-swarm. My heart sank a little though as I looked through the rest of the frames in the original hive. I had damaged the best of all the queen cells. Had I known, I could have removed Freeda from the frame and left that frame in the original hive. I had half a mind to call the whole thing off and reassemble the hive as one. I knew I was was jumping the gun, but I went ahead with the split, hoping that the remaining, less developed queen cells would make it. Or worse case that there were enough fresh eggs for the workers to start some more queen cells. I buttoned everybody back up and headed for home with equal amounts of anticipation and dread. Would they pull it off, leaving me with Freeda and her daughter working side by side? Or did I go and botch it all up? I waited a painstakingly long week before checking in on the queenless hive’s progress. At which point my heart sank even further. The two most promising looking cells had literally vanished. Perhaps the growing queens were subpar and the workers removed them. That’s my best guess anyway. At this point, there were no new, young eggs in the hive since Freeda had been taken away over a week ago. So I did the next best thing. I went into Freeda’s new hive and found a frame with eggs on it to swap into the original hive. I hated to take a whole frame of developing bees from her fledgling population, but it needed to be done for the other hive to survive. I drove back home. Dread outweighed anticipation this time. And now I’m in the midst of another painstakingly long week. My heart wants nothing more than to know how they are doing. But my head knows the best thing I can do is let them be. I’m better off just lying on my back in front of the hive and watching the traffic come and go. Wow! I love your bee posts. I learn so much every time I read them. Our property isn’t bee ideal (too many trees), so I’ll live vicariously through yours. Thanks for sharing! Fascinating post Jill. Best of luck to the hives. This reads like a whodunnit cliff-hanger! Keep me posted! this is why we are kindered spirits.. fascinating wild kingdom !! I’m at the edge of my seat. Long live Freeda!! This is a cliff-hanger! Or maybe a hive-hanger? Keep us posted! Thanks everyone for all the good bee energy! I will indeed provide you with a sequel.